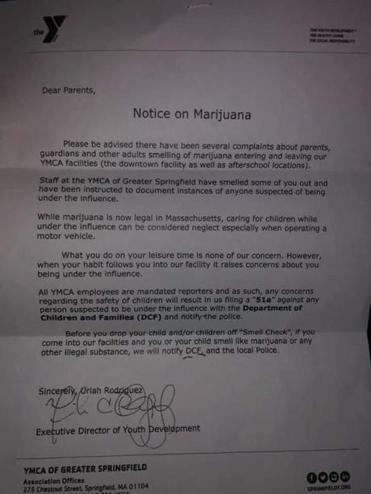 The Greater Springfield YMCA is apologizing to its members after a senior staffer posted a notice threatening to call the authorities on parents who smell like marijuana. In a letter displayed at several of the group’s Springfield-area facilities last week, Uriah Rodriguez, the YMCA’s executive director of youth development, said he had received complaints about parents and guardians “smelling of marijuana” while dropping off and picking up children. Rodriguez went on to note that YMCA staffers are legally obligated to report concerns about possible child neglect, and asked parents to “smell check” themselves before coming to the group’s facilities. “If you come into our facilities and you or your child smells like marijuana or any other illegal substance, we will notify DCF [the Department of Children and Families] and the local police,” he wrote. A picture of the letter was widely shared on Facebook, where it generated a strong backlash from cannabis advocates and other critics. They noted that marijuana is legal in Massachusetts (a fact Rodriguez’s letter acknowledged before later erroneously calling it illegal) and argued adults could smell like cannabis for any number of reasons — including being near someone else who had recently consumed the drug, working in the legal marijuana industry, or because they are a patient who relies on it to treat an illness. “It blows my mind that people would be faced with this hysteria for voluntarily membership in a club that’s supposed to be supporting them and their families,” she added. Under state law, legal marijuana consumption and other legal conduct related to the pot industry — such as working in a cultivation facility — cannot be the “sole or primary basis” for the state to take action against a parent, including removing children from their custody, denying visitation, or other parental rights and responsibilities. The provision was included in the 2016 marijuana legalization ballot initiative approved by Massachusetts voters. In 2017, as the Legislature rewrote the law, state Representative Dave Rogers offered an amendment to reinsert the clause after an initial draft had dropped it. In an interview, Rogers said the YMCA “is not properly aware of the law” and called on the group to better train its staff. Reached for comment by phone, Rodriguez acknowledged his letter “read a little bit wrong” and said he regretted that it created the impression that the YMCA objected to marijuana consumption. But he also said it had received positive feedback from members concerned about other parents using the drug. However, Rodriguez’s boss, Greater Springfield YMCA president and chief executive Dexter Johnson, took a stronger stance on the notice.